A “fish friendly farms” program has been initiated by NSW DPI. The program aims to raise the awareness of the state’s farmers to ways they can improve fish populations in their creeks and wetlands and at the same time assist in improving on-farm productivity. 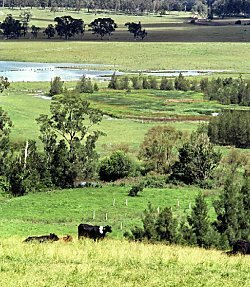 Often, due to poor advice or inadequate communication, many landholders carry out farming activities that degrade aquatic habitat and lead to a loss of fish from local creeks or rivers. An information brochure detailing the experiences of farmers who have made the changes and reaped the rewards has been produced. More information is available by contacting your nearest Aquatic Habitat Rehabilitation staff at the NSW DPI offices. The Fish Friendly Farms team have developed two new free colour brochures to inspire landholders to undertake more fish friendly management techniques on their property and help restore river health and native fish populations in NSW. 7 Key Tips for a Fish Friendly Farm provides technical advice on how to have a Fish Friendly Farm, details of why each aspect is important for native fish, contact details if advice is needed in making farms fish friendly, and also information about what grants are available to undertake on-ground works. The second brochure; What fish is this? is a guide to 56 species of freshwater fish in NSW. What fish is this? includes detailed colour pictures for each species as well as maps indicating their geographic distribution and is glazed to allow readers to take them down to the water's edge. Funded by the Murray Darling Basin Commission and the Natural Resources Advisory Council, 7 Key Tips for a Fish Friendly Farm and What fish is this? are available from your nearest NSW DPI office. NSW DPI provides fund for fish habitat rehabilitation on a competitive bases through the Recreational Fishing Trusts. These are funded through the licence fees for recreational fishing. There is a Saltwater Recreational Fishing Trust and a Freshwater Recreational Fishing Trust.